Conveniently located in the heart of San Diego. Enjoy Free WiFi, Free Parking, Designated Smoking Rooms, and Pet Friendly Rooms. Clean Comfortable Rooms with Double Pained Newly installed Windows for a quite stay. Located within a couple of miles of the Historic Gas Lamp District with Bars and great dining. 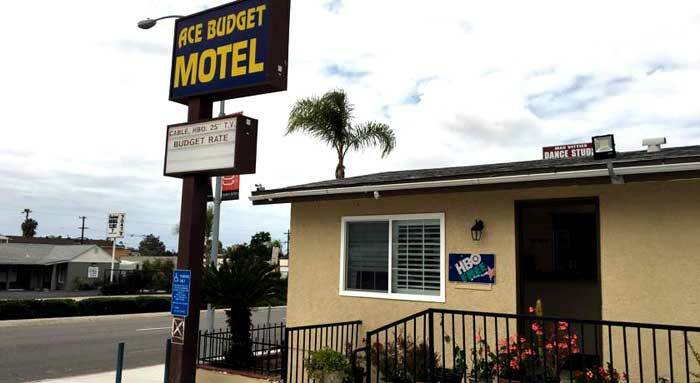 Situated in San Diego, this motel is 1.6 mi (2.7 km) from San Diego State University Art Gallery and 2.1 mi (3.3 km) from San Diego State University. Qualcomm Stadium and Mission Basilica San Diego de Alcala are also within 6 mi (10 km). Rooms provide conveniences like refrigerators and microwaves, plus free WiFi and flat-screen TVs with cable channels. Showers, desks, and free toiletries are among the other amenities that guests will find. Activities : The historic Gaslamp Quarter consisting of 16½-blocks around Fourth and Fifth Avenues, grand Victorian-era buildings are home to more than 100 of the city's finest restaurants, 100 retails shops, as well as theaters, art galleries and lots of recreational activites. To the outdoor enthusiast San Diego is truly a paradise, with near perfect weather and diverse landscapes-including beaches, mountains, deserts and rural back country to choose from. Attractions : This is at the top of our list. The San Diego Seaworld was the first Seawold in the world. You can see first hand various types of animals such as beluga whales, orca whales, a pilot whale, polar bears, dolphins, penguins, manatees, and much more. When it comes to the rides they are short and slightly dissapointing. It should be noted that this is the most expensive attraction, over $60 for an adult. We recommend you pay $10 more and get the 2 day pass. With this pass you get a behind the scenes tour. The tour is different each day, but we got a close up look at a pilot whale, and had the opportunity of petting various small sharks. Dining : In the mood for a night of great food, conversation, drinks, and relaxation amidst the hustle and bustle of San Diego? Featured are some of the finest culinary creativity of today's restaurant scene! Take your taste buds on a culinary adventure of masterpieces in San Diego. Events : Helping businesses in San Diego grow and flourish is a major focus of the City of San Diego. The City is dedicated to helping foster the region's economic base to improve the quality of life for its citizens and business community. Through many continuing programs and projects, the City creates opportunities for businesses to succeed. Government : I Helping businesses in San Diego grow and flourish is a major focus of the City of San Diego. The City is dedicated to helping foster the region's economic base to improve the quality of life for its citizens and business community. Through many continuing programs and projects, the City creates opportunities for businesses to succeed. Shopping : Even before browsing any of our 54 specialty merchants or perusing the menus of our 17 restaurants, you'll sense a difference at Seaport Village. It's shopping that doesn't quite feel like it. Four miles of tree-lined paths. Quaint maritime buildings. Fourteen acres of coastal paradise. Sweeping panoramas of San Diego's Big Bay. Weekly music and entertainment. All of it made even better by that everyday San Diego sun. Whether shopping, dining or just strolling, Seaport Village provides it all. Everything. Under the sun. Sports : The San Diego Padres are a Major League Baseball team based in San Diego, California. They play in the National League Western Division. Founded in 1969, the Padres have won the National LeaguePennant twice, in 1984 and 1998, losing in the World Series both times.